It is hard to be subversive in the 21st century. Writers and artists of all kinds have been aiming in that particular direction for so long now that it seems almost old-fashioned. And if you’re from what is commonly referred to as Eastern Europe, say Poland, you might as well forget about it altogether, because when your work goes westward your subversion will likely be domesticated and largely misunderstood. 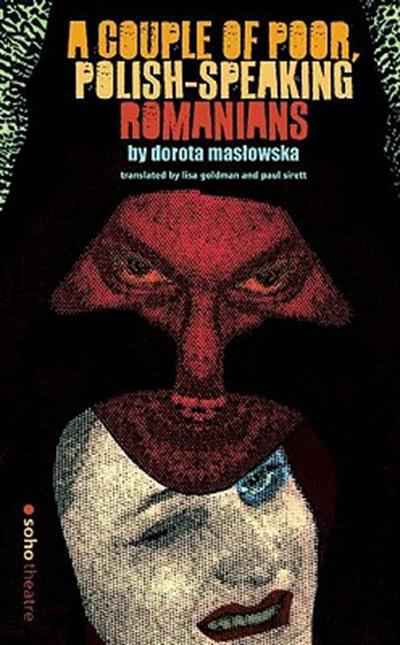 Polish literary sensation Dorota Masłowska’s debut play A Couple of Poor Polish-Speaking Romanians, could be taken as a textbook example of this phenomenon. Having been performed over the past few years in London, Prague, Chicago and in February for the first time in New York among other international locales, many of the write-ups it has received describe it as an Eastern European road trip in which the gross materialism of post-1989 Poland is shown in all its hollowness. Oh, and what a revelation that would be! Shopping malls aren’t where we can find true happiness. Consumer goods don’t answer our spiritual needs. Coke doesn’t add life! Really! Truly! The idea that these earthshattering discoveries would lead to literary success in the former Eastern Bloc is as condescending as it is stupid. It is true that in the opening moments of the play you get the impression that it really might be just the story of a rebellious Eastern European road trip – a middle finger pointed straight in the face of the smug “authority” figures shown voicing their complaints about the two young hitchhikers. But of the many things Masłowska subverts in the play, this initial assumption is the one that is handled most skillfully of all. Before you know it you are accompanying Gina, the drugged-up, seemingly pregnant single mother, and Parcha, the TV soap actor, into unknown territory. It doesn’t take long before their chemically-induced play acting begins to fall apart. Not only aren’t they Romanians, nor is Gina really pregnant, but they only just met that evening and know nothing about each other, including each other’s names. When clarity begins to return Parcha is desperate to get back to “real life,” which is to say, to acting, because he’s supposed to be on set at 8 am. This is his sole focus and he tries to give Gina a similar bond to reality by pressing her to answer where her 4-year old son is, something which she can’t remember through the haze. In a quiet moment he asks her about herself and she just says that she moves around. He asks her if she thinks that is real freedom. “I never said I was free,” she answers just moments before the play’s tragic ending and an epilogue steeped in irony, where the same figures of authority from the opening (plus a drunk driver we met along the way who was killed in a car crash) come back on stage to talk about the wonderful, vibrant young hitchhikers they had met, so full of potential. Masłowska’s penchant for writing about the darker side of youth culture has drawn comparisons to Irvine Welsh, but this play is darker in a different and more profound way than Welsh’s writing, and more closely resembles the ending of “Easy Rider” – the “We Blew it,” that Dennis Hopper’s Billy the Kid mumbled as a harsh epitaph of the 60s. What is left when the thrill of liberation has run its course? Of course Masłowska obliterates all the easy targets too – the hypocrites, the nouveau-riche, Polish self-congratulation and supposed solidarity – but it is her dissection of the two supposedly free spirited main characters that give the play its force, turning the road trip genre inside out and leaving the audience with two lost souls wandering aimlessly through dark forests unable to make it back home.